Tiny Wings is a fun new iPhone app from Andreas Illiger that has just taken the top spot in the App Store over Angry Birds. The game features a small bird with tiny wings who wants to fly and needs your help. The problem is the bird can only fly during daylight, so you have a limited time in which to cover as much distance as possible. When night falls, the level ends as your birdie run out of time. The bird uses a series a slopes as ramps to jump and even fly for short periods, sometimes flying over the ocean from island to island with max speed. Gameplay in Tiny Wings is quite simple. You just tap the iPhone screen when the bird is going downhill, and release when the bird is flying and going uphill. This helps him speed up and take flight temporarily. Touching the screen when the bird is in the air will bring him down, so avoid that as much as you can. Also don’t touch when the bird is going up the slope or you’ll slow down. Timing your touches gets more difficult with randomized mountain slopes and at higher speeds. The game is split into levels, called Nests. Finish the objectives in one level to move to the next one. For example in the first nest you have reach the 4th island, do 7 jumps and collect 100 coins to move on. Graphics in Tiny Wings are amazing and use a pastel finish to give the game a polished feel. There is also a catchy soundtrack and cute little sound effects when the bird gets a ton of air or eats the power-ups. Speaking of which, there are coins and blue pills in the first nest. The blue pills give you speed and you need to collect the coins as objectives. 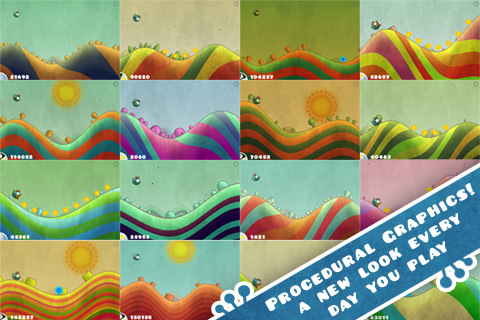 This game also has a procedural engine, meaning the content is dynamically generated. So each day you play you’ll notice a different look and feel to the graphics. 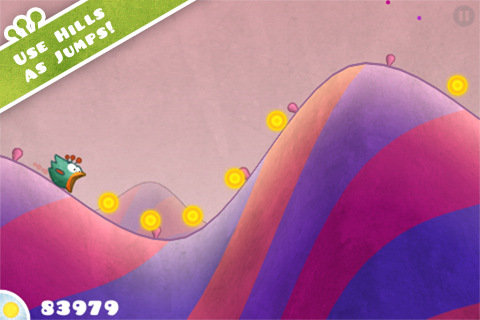 If you love casual fast paced games with a cute factor Tiny Wings is a must have. The action flows quite smoothly, and the graphics are amazing and change dynamically as day turns to night. It’s very easy to quickly learn and get hooked on Tiny Wings. I just wish it offered a bit more in terms of building up your character. AppSafari review of Tiny Wings was written by Joe Seifi on February 24th, 2011 and categorized under Action, App Store, Featured, Fun, Games, Platformer. Page viewed 7039 times, 1 so far today. Need help on using these apps? Please read the Help Page. Nice, it never gets boring because there are new islands with each physical day. Looks cool, think? its kinda lame how its night time that inexplicably kills you though, doesn’t seem well thought out. It’s okay! it’s fun once you get the hang of it!You have to try alot!